Host the Perfect Holiday Party with Stella! What better way to start the Holidays than with a family get together? 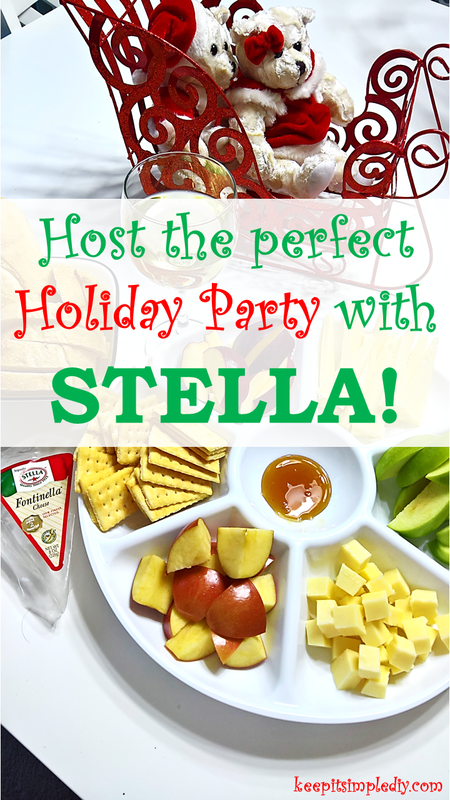 I’m proud to be partnering with Stella Cheese for this post to kick off the holiday season! Stella cheese feature a rich flavor that goes great in so many combinations! My holiday party tray was inspired by my fiance who works in a wine bar. I was getting ready to make a cheese platter with pepperoni, crackers, and cheese when he completely changed my mind. The platter is now more elegant and fancy, perfect for the holidays! Purchase Stella Cheese for your upcoming holiday parties. My cheese platter features Stella Fontinella cheese, three colors of apples, crackers, bread, and honey. While it may sound like a bit of an odd pair, the honey brings out the richness of the cheese and is so delicious. Just spread some honey on your bread and top with cheese. MMM. It’s also your lucky day because Stella is hosting a contest to win a trip to Napa Valley, California! For more information on their contest and to enter to win, visit Stella here. Stella makes your holiday party planning stress free because you know you will have a snack everyone will enjoy! I LOVE cheese… I’ve never tried stella… Def have to give it a try! This is my kind of party! Give me a wine and cheese night any time and I’ll RSVP yes!